Thanks for being on Academics Mean business! I want you to sound your best! Follow the tips below to ensure we capture a great recording of your beautiful voice. Click here to listen to other episodes. And don't forget to subscribe, rate, and review the show on iTunes to help keep this movement going! If you have any questions, you can always reach out at hello@lindsaympadilla.com. If you don't have one, mine is the ATR 2100. It's about $65 on Amazon, sounds great, and is super simple to use (just plug in via USB). Another option is to get a headphone/mic combo, which takes care of the next tip below. I recommend the LifeChat LX-3000 headset, which is less than $25 on Amazon. Otherwise I get a terrible echo from your mic picking up my voice in the recording. Listen below for an example. Copy and paste chrome://settings/help into Chrome to see if a Chrome update is available. Our recording software (Zencastr) requires the most up-to-date Chrome. If Chrome's not the newest version, we might loose the audio to popping noise. Go to your computer's sound settings and set your input level to about 50% of full volume. The video below shows how to do this on a Mac. 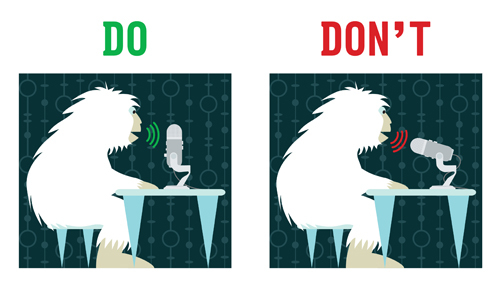 If you have a Blue Yeti mic, speak into the side with the mute button. Don't point the tip of the mic toward you. On the back, set the gain to about 11:00 and the pattern knob to cardioid (the third setting that looks like an upside down heart). The knobs should look like what's shown below. Plug your headphones into the bottom of the mic. On the front, adjust the volume knob to whatever's comfortable in your ears. This knob doesn't affect the recording, only what's going to your ears. While recording, the mute button should be solid red. If it's blinking, you're muted and the mic won't pick up your voice. If the light is off, you're not connected to the computer. Check your cable by unplugging and plugging back in, both at the computer and at the Yeti. Select the Yeti for both the input AND output of your computer's sound. Then set your input level to about 50%. Watch the video below to see how. Talk into the side of the mic with the mute button. On back of Yeti, set Gain knob to 11:00. Plug headphones into bottom of mic. Adjust Volume knob to a comfortable level. Ensure mute light is solid red. Not blinking, and not off. Select the Yeti as your computer's input AND output in Sound Preferences. Set input level to 50% in your computers Sound settings.